A marine radio is an essential device for any keen boater as having one of these onboard could save your life. If this fact alone isn’t enough to persuade you, then perhaps the ability to contact the US Coast Guard at a click of a button and to receive regular updates and alerts on what the weather has in store will. You can also contact other boats near to you via a marine radio. A marine radio has many impressive features, and you can purchase ones that are fixed permanently to your boat or are handheld. There are so many out there on the market it can be difficult to select the right model for you. Read on to see our reviews on some of the best marine radios out there and a straightforward guide about what to think about when purchasing a marine radio. Q&A: What is the distance range of this radio? Q&A: Can this also be used as a two-way radio? 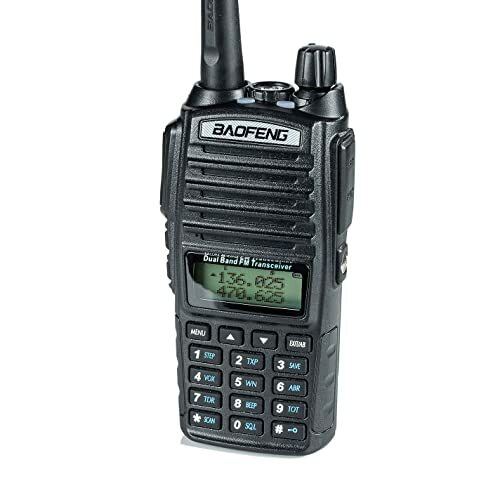 Q&A: What is the difference between this model and BaoFeng’s BF-F8HP? Q&A: Does this come with DC battery backup? Q&A: Can you charge this device without the desktop charger? Q&A: Is this a flexible antenna? What can a marine radio do? How do marine radios work? What are WAAS and GPS? What is the difference between VHF, UHF and two-way radio systems? What features will I need my marine radio to have? Can I receive weather alerts on my marine radio? Should I buy a handheld or fixed-mount marine radio? If you are looking for a cheap handheld marine radio, that is cheap only in price and not in nature, then Uniden’s excellent MHS75 model will be right for you. It comes with features typically found in models at least twice the price or more, such as being both waterproof and submersible, the ability to float, having a decent 12-hour battery life, and being pre-programmed with US, Canadian and other international channels so you can keep on top of current marine activity. This handheld VHF radio enables you to keep track of up to two distress or hailing calls simultaneously and includes a channel for both weather updates and marine lines. Using the dual quad watch operation mode you can actually monitor two coast guard distress calls as well as one weather channel and one normal marine channel. NOAA weather channels are also pre-programmed, whilst the weather alert function means you can stay informed of any emergency weather warnings. This is rated to JIS8/IPX8 standards, so you can be sure about its ability to withstand up to 30 minutes submerged in the water, and that it will float so you have the chance to rescue it if it does end up in deep water. The design is also sturdy enough to stand up to the test of time and regular use. A useful design feature is the clip-on DC charger which rapidly charges the unit of any cigarette lighter style12-volt DC outlet. This is fitted with a high-end lithium-ion battery that is quicker to charge, have a longer battery life and a more lightweight (it weighs just 1.4 Lbs!) making it one of the best portable marine radios out there. It also comes complete with an effective antenna, DC adapter, belt clip and a wrist strap so you have everything you need on arrival. So if you don’t want to shell out too much cash, but want all the features of a top quality marine radio, this device will probably leave you wondering why anyone pays more than this. A: VHF transmissions are ‘line-of-sight’ transmissions meaning that so long as the two locations can ‘see’ the antenna of the other, they will be able to communicate. The stated maximum range is 16 miles. However, likely maximum distance itself will depend on atmospheric conditions and the curvature of the earth and sea swell will likely restrict this line of site to under 16 miles unless the antenna is very tall or placed at a great height. One of the key reasons anyone invests in a marine VHF radio is the added security of being able to call for help in case you ever found yourself stranded or in unexpected conditions. This waterproof model from Standard Horizon takes security a step further by making the device float, meaning you’ll be able to reach it no matter what. With 66 WAAS channels, weather alerts, and a useful USB data port, this model is also packed full of features. With internal GPS, VHF, DSC calling and a separate receiver included to receive DSC calls, you can be sure to be reachable through multiple means and channels, whilst also having the tools at hand to give accurate and precise readings of your location in any emergency situation you may find yourself in. Useful features include a USB port which makes this device easy to charge and link to other devices, whilst the ability to preset up to 10 favourite channels is also very handy. The oversized full dot matrix display is also clear in tough conditions and noise cancellation means you have the best chance of being heard when you need it most. Rated to IPX8, this unit can stand being dropped in the water to 1.5 metres for up to 30 minutes, giving you extra security that you won’t risk breaking it in a crisis situation, or even if you are just a bit clumsy! So if you want maximum security beyond simply waterproofing, this is the best VHF marine radio for you. A: Yes, if you buy two you can use it in this way. 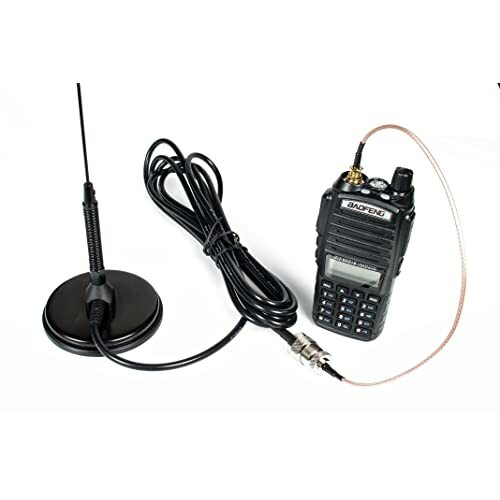 If you are likely to find yourself in built-up areas, whether that be cities, densely populated forests, or mountainous settings, you would be wise to invest in this UHF capable marine radio from BaoFeng. With this best marine AM FM radio you will get a high gain antenna which helps to ensure optimal performance even in these troublesome areas thanks to a UHF range of 400-520 MHz, whilst the VHF range of 136-174 MHz also means you can stay connected. This model comes with a useful and extensive user guide to help you navigate user menu and offer programming tips to help you get the best use out of the 128 programmable memory channels. You can also give channels alphanumeric names with a computer making them easier to access, whilst the 3 power levels enable you to choose how far you wish to be able to communicate at any given time. Despite its low cost, you will love playing around with the programmable features this unit has to offer, both on the handset itself and when connected to a computer. An excellent feature of the UV-82HP, which is not found even on many higher priced units, is the dual push-to-talk switch which enables you to switch between two frequencies with the flick of a switch. This enables you to use one frequency as a scanner and the other for a specific frequency, or a CCSS or DTS code although you can set the unit up to use a single frequency if you prefer. It is also capable of watching two channels or frequencies, with preference given to the first station which receives a call. This unit is also built with a sturdier casing than previous BaoFeng models and an upgraded chipset and PCB board which improves both accuracy and range of previous models. So if you choose marine radio for built-up environments and one that offers both UHF and VHF frequencies, with great functionality, this BaoFeng will blow you away. A: Aside from the detailed user guide, this model has a much louder speaker and has a much more durable design, as well as the dual frequency flick switch and even a selection of colours for the handset. If you are after a radio suitable for both marine and other off-road activities, then this all-terrain radio from Cobra is a great option that is ruggedly designed, built to IPX7 standards and even has a so-called ‘BURP’ function which can make water vibrate out of the speaker to improve its performance even when it’s raining. For a fraction of the price of many marine radios, you don’t lose out on much on a radio that is also suitable for use on dry ground. Unlike most radio’s suitable for marine use (ie. has a VHF marine band), this unit is also suitable for use on land thanks to its ability to pick up GMRS signal, which is a land-mobile FM UHF radio service suitable for two-way communication over short distances. However, whilst this can be used without a license in Canada, this functionality requires a license if it is to be used in the United States. With a top of the range lithium-ion battery, this charger is unbelievably lightweight at just under 10 ounces, charges quickly and lasts a long time even under high usage. Cobra are known for their durability and this is no different as it built to withstand inevitable drops and even a 30-minute bath won’t see the death of it. Thanks to its float-ability you will be able to put it back to use whether you drop it in a puddle, down the river, or even in the ocean. You also get excellent noise-cancellation with this device, NOAA radio stations pre-programmed, emergency weather alerts, and the option to replay missed VHF calls thanks to useful built-in rewind technology. So, if you are after a cobra and want a useful radio that is suitable for use wherever you may find yourself in need of its excellent safety features, this is the device for you. A: The kit comes with a rechargeable battery pack, a cord to plug into a cigarette lighter, and a separate battery holder suitable for AA batteries, so you have plenty of options to make sure you have the power you need no matter what. If you are looking for something that won’t cost you an arm and a leg, but still offers decent safety features and a variety of methods to communicate with others, then Midland’s GXT1000VP4 kit is an efficient and surprisingly cheap two-way radio system with great features. The 2 included handheld radios act as walkie-talkies, come with 50 GMRS channels, are splash resistant, and have a 36-mile range for communication purposes. Another useful feature is the ability to undertake an NOAA weather scan. This comes complete with an alert feature which helps to ensure you are aware of any extreme weather forecasts. This function scans 10 channels and will alert you with a piercing alarm sound if a severe weather warning is situated within your area. Whilst this device is a waterproof and splash proof, it is not waterproof, does not float, and is not rated to any IPX level, so you do need to be careful if you are handling it out on the water. Fortunately, the included belt clips help reduce any risk of dropping the device, and the complete kit includes 2 handsets with rechargeable battery packs, a 120-volt desktop charger, DC and AC adapters and an extensive user manual. Additional settings act to multiply the channels, so you are able to increase your privacy settings 60 times over. You will also be kitted out with a powerful handheld radio with an unbelievable range with excellent hands-free functionality if you invest in this long-range two-ray radio system. So if you are after great value, long-range, and secure radio communication, this is the setup for your needs. A: You need to plug it into the included base to charge it directly, but you can power the device with rechargeable AA batteries if needed. For a fixed-mount marine radio, you can rely upon then this Uniden VHF marine radio is a product you can have the utmost confidence in. Small in size and easy to install this marine radio will fit a variety of boats, it measures 11 x 9 x 4 inches and requires a connection to a 12V battery onboard your boat. Once set up you can breath easy that you have access to essential safety information and call outs at your fingertips. Featuring GPS data and DSC positioning you can contact the boats around you with this marine radio, so you can inform your fellow boaters of possible hurdles in the water or just to say hello. It is also capable of receiving emergency weather alerts from NOAA using Specific Area Message Encoding (SAME) where a code for your location triggers warnings about any dangerous weather conditions that are close to where you are. Essentially, the Uniden UM380 is able to connect to all marine channels within the US and Canada and, on top of this, it can also connect to international marine channels. This sophisticated fixed-mount marine radio also allows you to allocate names to specific channels so you can find them quickly. It is also fitted with a distress button so you can quickly and easily call for help when you need it. This is a two-way radio so you’ll be able to communicate with the coast guard should you need to. Other important features are its rugged durability and that it is water resistant so it doesn’t matter if it receives a splash. You will also enjoy the easy to read display which is backlit, an essential feature if you find you experience difficulties when in darkness. Does this fixed-mount marine radio come with an antenna included? No, it doesn’t – you will need to purchase this separately. Check out our review of the best marine radio antenna below for an idea. If you are looking to extend the range of your marine radio, then this easy to install Nagoya UT-72 with a powerful magnetic base will be just what you after. This 20-inch antenna is made from stainless steel, whilst the built-in super loading coil helps to massively extend UHF reception. The powerful magnetic base makes it both easy to install and sturdy enough to withstand tough weather conditions. With an impressive 14-feet of durable RG-58 cabling included you can mount this 2.5-mm thick antenna wherever it will increase your range the most, and still have great flexibility of use. When vertically mounted this antenna is also omnidirectional, meaning that to can receive signal from any and all directions. You will need to check which radio models it is compatible with, but so long as your radio uses either SMA-Female or SO-239 adapters you should be fine. Installation is made easier thanks to an included SMA jumper which enables you to easily link to your handheld or mobile radio system. You also won’t lose performance with this cable despite its length. The heavy-duty rare earth magnet in the base also means that this antenna can be easily and securely attached to anywhere with a metal grounding plane. With an impressive 4 dB of gain to be obtained with the installation of this antenna ensures your communication is clear as well as reaching further afield. So if you need extended range and clearer reception on UHF or VHF frequencies, this antenna will be a great option that won’t leave your pockets empty. A: This antenna is not a flexible antenna, but is extremely weatherproof. If you enjoy being out on the water you will know that safety is a paramount concern and that it can be easy to run into trouble if you are sailing into unknown territory. Having a marine radio station onboard your vessel means that you have the means to make a distress signal if you run into difficulty whilst out at sea. With good quality marine radios this can be done with very little network coverage so you can call for help even if you are in the middle of nowhere. As you can see, a marine radio really is an essential item to invest in. In addition to allowing you to make distress signals, with a marine radio you can contact other boats that are out on the water. You can also listen to the shipping forecast and set up alerts so that you can receive alerts when emergency weather warnings are in place. Marine radios really are worth their weight in gold when it comes to keeping you and your seafaring companions safe when you are out on the water and we guarantee it will be a reassuring presence on any outing. Most marine radios work by using Very High Frequency (VHF) radio waves to connect you to the US Coast Guard which is part of the Global Maritime Distress and Safety System. Receiving distress signals via a VHF-FM radio is the US Coast Guard’s preferred method for reporting emergencies so a marine radio is the perfect way to do this. Many marine radios are fitted with a GPS receiver – as many of you will know GPS stands for Global Positioning System and uses information from satellites to identify your location. This function is essential within a marine radio so that you can inform the US Coast Guard of your exact coordinates should you run into difficulty. You will also see that some marine radios come with an integrated WAAS GPS antenna, so what is WAAS? It stands for Wide Area Augmentation System and has been designed by the Federal Aviation Administration to augment GPS in order to provide a more accurate identification of location through using a system of ground reference stations within the US. If you select a device with a WAAS receiver you can expect to improve your position accuracy by five times more than if you just used GPS. This comes at no additional cost, other than what you pay for your marine radio so is a worthwhile consideration before making a purchase. When on the hunt for a marine radio you will no doubt have come across radios that are VHF, UHF or two-way radio stations. So what is the difference between these and what type has the best marine radio frequencies? A two-way radio station simply means that it can both receive and transmit radio signals that are operating on the same frequency. So, ultimately, you really want a device that can do this, otherwise, you won’t be able to be kept in the loop about a potential rescue operation or receive important emergency weather updates. VHF is what you will most commonly see when perusing the marine radio market as this type of signal is most frequently used in these devices. VHF are best suited to outdoor use as they work best in open environments. They can travel a greater distance than UHF radio waves, though they do run at a lower frequency. If you are likely to be sailing in more built up environments then it might be better to consider a marine radio that uses UHF radio waves. UHF stands for Ultra High Frequency, and this means that they can travel through structures and obstacles so work well in heavily populated areas such as towns and cities, or areas which have a lot of woodland or mountains. So before you choose your marine radio make sure you have a think about where you will be using it and whether VHF or UHF radio waves would be the more appropriate option for your location. The next thing to think about is what sort of features you want your marine radio to have so that it fits your requirements and safety expectations. As you will, of course, be using your marine radio on the water it is a good idea for it to be waterproof so that it won’t get damaged if it gets inevitably splashed by the waves. Some marine radios come with an IPX rating, and the higher the IPX rating the more waterproof your device will be. So if the marine radio has an IPX rating of 8 it will be protected even if it drops into 3 feet of water! Now onto buoyancy, very sensibly some marine radios are now designed to float so if you drop them into the depths of the ocean they won’t go plummeting to the seabed. This is important for two reasons. First of all, it means that if you do drop it in the water you can easily retrieve it and won’t need to buy another one. And secondly, and more importantly, it could be a life-saving feature if you found yourself in a rescue situation and your marine radio was thrown overboard. Yes, this is a key feature of a marine radio. To make sure you are safe whilst out at sea it is a good idea to receive regular weather updates through your marine radio. You can either tune into the appropriate channel or set up alerts. Most commonly, weather alerts come through the well renowned National Oceanic and Atmospheric Administration (NOAA) who run 24-hour forecasts and weather warnings. Access to up-to-date and accurate information on the weather is essential for any boating enthusiast and a marine radio is a straightforward way to do this. We’re sure you won’t regret investing in a marine radio to keep you safe on your marine adventures. There are two types of marine radio, the fixed-mount type which is a permanent feature of your boat and is connected to your boat batteries for power. And the other is the handheld marine radio which is, as the name suggests, a very portable device which is powered by the batteries inside it. Before you decide which variety is best for you we will have a quick run through of the features of each. Fixed-mount radios benefit from being powered by your boat’s electrical system so it won’t run out of battery unless your electrical system goes down for whatever reason (as this is a possibility it is a good idea to have a handheld marine radio at your disposal also). Other advantages that the fixed-mount radio has over the handheld is that they are able to transmit a higher wattage of power and have a greater range in terms of radio waves. Some fixed-mount radios are able to transmit as much as 25 watts of power, this translates to a range of about 30 miles. With a fixed-mount radio, you need to attach the antenna separately to the highest point on your boat – you can get a variety of different antennas to suit all types of boats. Handheld marine radios do not benefit from the same breadth of power and range as fixed-mount marine radios. However, what they lack in power they make up for in their ability to be useful in a crisis. Its portability means that it is not dependent on your marine electrical system to function, so if this goes down the handheld marine radio will still be able to save the day. You can keep it in your pocket so it is to hand whenever you need it. Depending on the quality of the model your purchase, the batteries in a handheld marine radio can last for between 7 and 20 hours. You need to balance the need for battery life with the need for buoyancy as, generally, the longer the battery is able to last the bigger the battery is and potentially the less likely it is to be able to float should your boat sink. Make sure you check the specifications of the handheld marine radios so you can make an informed decision about these aspects. You really don’t need to think twice about investing in a marine radio for your vessel as the benefits of having one of these onboard are indisputable. If you run into difficulties whilst out at sea then a marine radio allows you to put out a distress signal to the coast guard, and could just save your life. It can also alert you to any potential extreme weather events in your area so you can get out of the water to safety before its too late. They can also be helpful devices to keep you in touch with fellow boaters if they are in close range so you can communicate important information to each other. Marine radios come in different shapes and sizes, and with different range abilities and power ratings. You can get some that are a permanently fixed to your boat and others that you can keep in your pocket. Advancing satellite technology such as WAAS is frequently fitted within marine radios, so look out for this feature to ensure that the accuracy of your location is spot on. Whatever you decide, a marine radio really is an essential item for any boating enthusiast to ensure that you are kept safe. Great piece, great for me because this was something I needed to read. Thank you.